From the opening moments, it's undoubtedly clear where the greatest of strengths lie. Natasha Braier's hypnotic visuals and Cliff Martinez's sumptuous score are each masterful pieces of work on their own, but when combined, something utterly special fills the senses, entrancing viewers further into the latest world Refn has crafted. 16 year old Jesse (Elle Fanning) has moved to Los Angeles, with aspirations of being a model. She's signed up with a modelling agency, where her boss Jan (Christina Hendricks) advises her to say she's 19 (as 18 is too on the nose). Clients and rivals are entranced by her natural beauty, a result of her youth and look of innocence, but as she ventures deeper down the rabbit hole, Jesse doesn't comprehend the danger she's putting herself in. Following on from the largely divisive Only God Forgives, Nicolas Winding Refn's first foray into the horror genre and female led pictures is closer to that picture than his most accessible work, Drive. What Refn delivers is a dark satire on the concept of beauty, as well as the industry itself. A lifestyle where, in this cutthroat business, models aged 21 are considered past it, and likened to sour milk. As our entry point into this dark world, Elle Fanning easily showcases why everyone is obsessed with her, proving to be a spellbinding presence throughout her journey. With the smallest of looks, Jena Malone perfectly sells her character of Ruby: carrying more than a mere interest in Jesse. The result of an infatuation, or something else entirely? Abbey Lee and Bella Heathcote remain exquisite in their roles, fearlessly venturing into the material, game for whatever comes their way. In his short screentime, Keanu Reeves acts rather creepily, while the intensity of Desmond Harrington is chilling in its own way. Karl Glusman acts as one of the few genuinely good people, believing there's more than just beauty, and is made unwelcome for his differing views. For a first time venture into the genre, an unsettling tone is balanced remarkably well, evidently felt throughout the running time, but it's never more apparent than in the final act. This is when the film truly lets loose, delivering something one won't believe is unveiling before their very eyes. No spoilers, but it's equal parts batshit and brilliant, utilising rather unique methods of satirising the world of modelling. 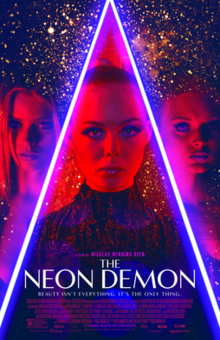 Nicolas Winding Refn's latest picture is delivered as one heck of an experience, as opposed to unfolding in the traditional storybook manner like traditional pictures. The Neon Demon will remain with you long after initial viewing, from hypnotic opener to unbelievable end.